The Sleep EZZ Deluxe Adjustable Bed is the perfect choice for anyone looking for an adjustable bed that will stand the test of time. 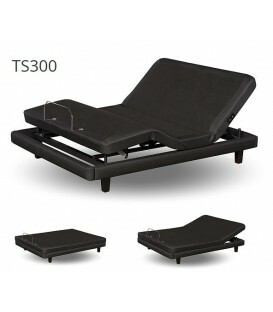 If you have back pain, sleep issues, or simply enjoy reading and watching TV in bed, this bed is a great choice. With an independently moving head and foot and soothing massage this bed can be positioned in the perfect place to suit your personal sleeping needs. This bed comes standard with a lifetime warranty on the frame, and five year on the mechanism and electronics. If you have back pain, sleep issues, or simply enjoy reading and watching TV in bed, the Sleep EZZ adjustable bed with Ultra-Ezz Massage standardis a great choice. 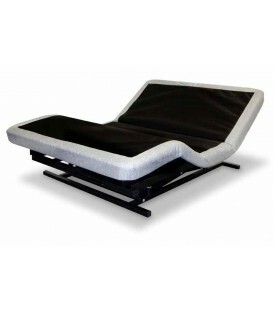 With an independently moving head and foot and soothing massage this bed can be positioned in the perfect place to suit your personal sleeping needs. 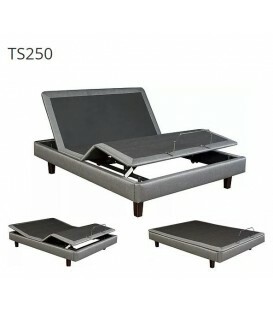 This bed comes standard with a lifetime warranty on the frame, and five year on the mechanism and electronics and a wired remote control with automatic massage shut off. The Ultra-Ezz Massage system is labeled as a Class 1 Medical Device due to its benefits of being able to move blood and fluids throughout your body, and it features a timer which can be set for multiple time segments with an automatic shut-off. The Ultra-Ezz Massage System quietly delivers "multi-directional" (vertical as well as horizontal), motion through its 5-lb. motors. This delivers a deeper massage, which allows the body to relax and fall asleep faster. Head and foot operate independently with state-of-the art electric motors. 11-ply industrial-strength plywood base bolted to mechanism. All Sleep-EZZ beds meet and exceed the flammability mattress code 16 CFR 1633. Lifetime warranty on frame; five-year warranty on mechanism and all electronics. Back-lit, raised button, individually diagramed, ergonomically-designed remote control. Features 30-minute timer on remote control. This unit features a wired remote control unit. Specially designed, heavy duty motors. 2", 4", 6" height extensions. Headboard brackets that enable connection to most standard headboards. Our top of the line power mattress foundation includes features and the value of much more expensive beds. This model features a weight capacity of 600 lbs. and can be considered a bariatric unit.